All hunters must have a valid hunter's education card at the time of registration, unless exempted by the DNR guidelines. 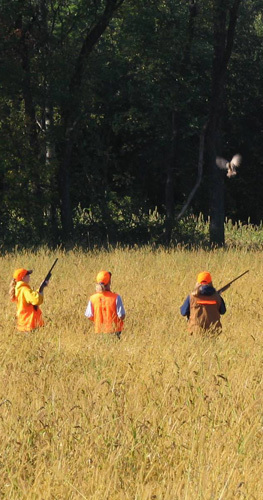 Children under the age of 16 and spouses may hunt without the release of minimum bird requirements with paying adult. In the event of inclement weather, hunts may be canceled with little or no advance notice. Please call at least 24 hours in advance if you need to cancel your hunt. All Hunters MUST register before and after hunting. This is a safety requirement. Failure to register may cause forfeiture of your membership or hunting privilege. A blaze orange hat is required. Additional orange clothing is recommended. Please keep your dogs kenneled until you arrive at your field. Please confine your effort to the assigned field. Sportsmanlike conduct is expected at all times. Violations of safety or conduct will result in the loss of hunting privileges.